Dovesfoot Geranium is a small plant reaching on average 5-30 cm in height. It is a very branched plant, quite hairy, with several ascending stems. The leaves are palmately cut 5 to 9 times. The basal leaves are arranged in a rosette, the upper ones are stalkless, rounded and hairy, with a long stalks of about 0.5-1.2 cm. 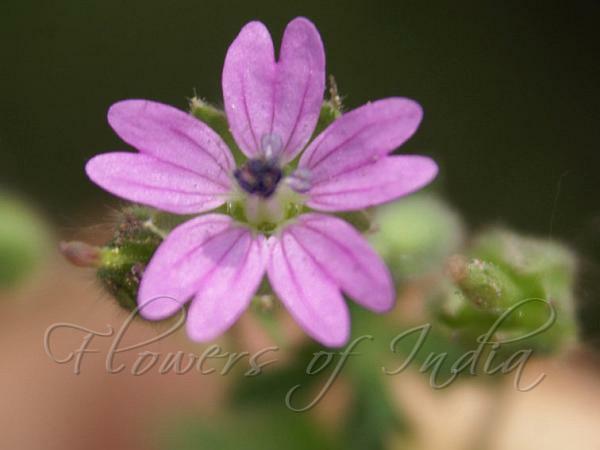 The flowers are pinkish-purple, 0.8-1.2 cm in diameter, with 5 petals which are deeply notched. Fruits are hairless, usually with 6-9 transverse ridges. This species can be identified by its hairless carpels, pinkish flowers which have deep notches in the petals, velvety stems, and simply acute sepals. 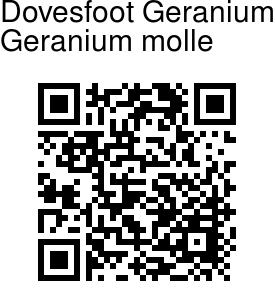 Dovesfoot Geranium is native to Europe, Africa, West Asia and NW India. Flowering: April-September. Medicinal uses: It is found by experience to be good for wind cholic, as also to expel the stone and gravel in the kidneys. The decoction thereof in wine, is an excellent good cure for those that have inward wounds or bruises, both to stay the bleeding, to dissolve and expel the congealed blood, and to heal the parts, as also to cleanse and heal outward sores, ulcers and fistulas; and for green wounds, many do only bruise the herb, and apply it to the places, and it heals them quickly. The same decoction in wine fomented to any place pained with the gout, or to joint-aches, or pains of the sinews, gives much ease. The powder or decoction of the herb sinews, gives much ease. The powder or decoction of the herb taken for some time together, is found by experience to be good for ruptures and burstings in people, either young or old.